I'm referring to the flowers, not the weather! 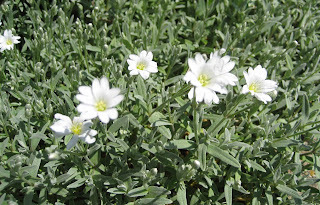 Cerastium tomentosum, Snow-in-summer. It's a beautiful day, not a snowflake in sight, except for this snow-in-summer. And beautiful little Snow-in-the-summers they are. I'm glad the weather is good for you. This will be the third day in a row of 90s. We went from a cool spring to mid-summer in a day. My Snow-in-Summer isn't blooming yet, but it's looking good! Soon it will be blooming though. I just love it. My mom gave me mine. Got my GTS up late, but it's there now! Cerastium I had in my previous garden. It's such a lovely plant and so easy to grow. Excellent groundcover too. Love those silvery leaves. Cerastium has a small and beautiful flower . Congratulations !!! You have a lovely page.